“Les Ombres Errantes.” François COUPERIN: Suites pour clavecin du Quatrième Livre (1730): Ordres 22, 26, 20 and 25. Mitzi Meyerson (hpsi). Glossa GCD 921802 (http://www.glossamusic.com/). Distributed in the US by Qualiton (http://www.qualiton.com/). Couperin’s Fourth Book reflects a lifetime of performing, teaching and circulating through the French court. When published in 1730, its 62-year-old composer was the epitome of taste as well as a sly caricaturist. Glossa’s blustery notes celebrate Le Grand’s perfection of this apparent contradiction. 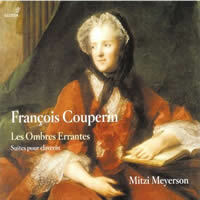 We are reminded that Couperin said: “I have called my works Orders, although I could have called them Disorders just as accurately.” Meyerson’s selections offer virtuosity, miniature tone poems, triviality and numbing melancholy. L’Anguille’s sprightly contrapuntal moves (ordre 22) hint at the rumored correspondence with J.S. Bach; given the Overture at the Goldberg Variations’ center, Bach probably knew Le Trophée (ordre 22) and La Visionaire (ordre 25). Ordre 22 contains hand-crossing magic in Le Croc-en-jambe and Les Tours de Passe-passe. Ordre 26 opens in F-sharp minor, though the tuning of Meyerson’s instrument, a 1998 double-manual Keith Hill modeled on a 1769 Taskin, doesn’t emphasize the key’s piquant remoteness. Ordre 20 collects a string of dances with colorfully ambiguous titles, among them Les Chérubins ou L’Aimable Lazure, La Croûilli ou La Couperinéte and La Douce Janneton. The opening La Princesse Marie refers to Maria Leszczynska, not yet Queen of France. I’ve reflected before upon Ordre 25’s poignancy. While La Visionaire and La Muse Victorieuse may strut provocatively, the chromatic La Mistérieuse emphasizes a mood of withdrawal. The concluding Les Ombres Errantes leaves a bleak but ravishing residue. Meyerson plays expertly, though I admit to a preference for Tharaud’s piano color and Romantic leanings. François COUPERIN: Pièces de Violes Avec La Basse Chifrée Mr. F.C. : Suites 1 and 2 (1728); Les Goûts Réünis: Concerts 10, 12 and 13 (1724). Markku Luolajan-Mikkola, Mikko Perkola (bass viols), Aapo Häkkinen (hpsi). Avie AV 2132 (http://www.avierecords.com/). Distributed in the US by Forte Distribution (http://www.fortedistribution.com/). 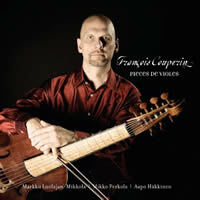 Published the year Marin Marais died — perhaps in homage — Couperin’s two viol suites occur at the genre’s apex. Luolajan-Mikkola devotes full attention as a soloist should; the accompanying viol and harpsichord take secondary roles. The first suite culminates in a bright Passacaille. Three concerts from Couperin’s 1724 collection, Les Goûts Réünis, which strives to marry French and Italian styles, complete the release. The Twelfth and Thirteenth concerts explicitly call for two bass instruments, perhaps modeled on Ste. Colombe’s Concerts à deux violes égales, and Perkola ably steps up as duet partner. The harpsichord returns in the Tenth, the closing of which, entitled La Tromba, bears a Corellian complexion. Friedrich Wilhelm MARPOURG: Pièces de clavecin (ca. 1748; 1756). Yves-G. Préfontaine (hpsi). Atma ACD2 2119 (http://www.atmaclassique.com/). Distributed in the US by Naxos (http://www.naxos.com/). A German music critic and journalist, Marpourg (variously Marpurg) visited Paris around 1746, where exposure to the pièce stimulated him to try his hand at the genre. This reissue of Préfontaine’s fine 1996 playing establishes these ca. 1748 works as conservative yet tasteful. Anyone anticipating Rameau or Royer will not be disappointed by the modest dramatic moments among clear-cut forms. Grouped by tonality as is the custom, the Second suite contains but two movements, and the First and Third only three each. Tambourins in the Third sound a bit like the tunes that made it to America, as in Reinagle’s “Philadelphia” sonatas. The Fifth and longest suite is the most mature, with virtuosic splashes in the opening La Nymphe Marine and more adventurous harmony within the final Les Drÿades. Atma’s program concludes with two Allegros from a different age, C.P.E. Bach-like pre-Classical torsos from Marpourg’s 1756 Principes de clavecin (online here). Marpourg (1718-1795) spent the last 30 years of his life as a Prussian civil servant directing the national lottery. Préfontaine plays a 1986 Yves Beaupré modeled on a Hemsch. Antoine FORQUERAY arr. Jean-Baptiste FORQUERAY: Pièces de clavecin (1747). Blandine Rannou (hpsi). Zig-Zag Territoires ZZT080301.2 (http://www.outhere-music.com/en/labels/zig-zag-territoires). Distributed in the US by Allegro Music (http://www.allegro-music.com/). “Tombeau pour Mr. de Ste. Colombe et autres portraits…” M. de SAINTE-COLOMBE: Prélude, Concert à deux violes égales. 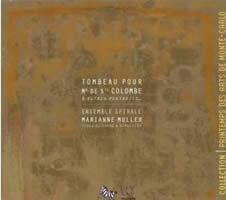 Marin MARAIS: Tombeau pour M. de Ste-Colombe; Tombeau pour M. Lully; La Marianne. 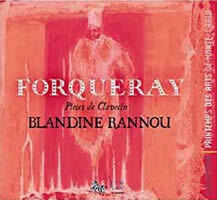 Antoine & Jean-Baptiste FORQUERAY: La Laborde, La Rameau, La Leclair, La Forqueray, La Couperin. Denis GAULTIER: Tombeau de Gautier. Jean-Phillipe RAMEAU: La Rameau, La Forqueray. Vieux GAULTIER: Les Larmes de Boesset. Ensemble Spirale: Marianne Muller (viol), Violaine Cochard (hpsi), Claire Antonini (theorbo, lute), Charles Edouard (guit, lute), Emily Audouin (bass viol). Zig-Zag Territoires ZZT080302 (http://www.outhere-music.com/en/labels/zig-zag-territoires). Distributed in the US by Allegro Music (http://www.allegro-music.com/). There’s a fascinating story behind these Forqueray Pièces. The father, “the world’s greatest viol player,” so feared his son’s abilities that he had him imprisoned and briefly exiled! Two years after le Père’s death, le Fils published a handful of his father’s pieces scored for viol and continuo and a parallel collection arranged for clavecin alone. Forqueray Jr. slipped in a few of his own and though we know which ones, stylistically the generations are indistinguishable. Typical of the day, many honor colleagues: La Rameau, La Forqueray, La Couperin, La Leclair, La Laborde, La du Breüil, La Marella, etc., whereas other titles remain obscure. Betraying their viol origins, these pièces de clavecin hug the harpsichord’s tenor region, the high tones of the Second suite’s Italianate La Leclair a sparkling exception. Rannou plays a 1988 Anthony Sidey (modeled on a Ruckers-Hemsch) which provides perfect oomph in this range. Track listings appear only on the cover. The first two tracks on CD one, the Fifth suite’s La Rameau and La Guignon, mistakenly reprint names and times from CD two. Fastidious listeners may be perplexed by Rannou’s capricious pulse, far from the customary delicate application of notes inégales. Scott Ross’ snappy rendition of the Fifth suite’s La Sylva (INA IMV017) in 3:27 contrasts markedly with Rannou’s languid 8:44, with the 1979 live Radio France taping capturing Ross in delightfully high spirits. In several pieces Rannou’s way works to grand effect, such as the First suite’s theatrical La Portugaise with its clusters and ethnic styling, and the Third’s La Régente and La du Vaucel (one of le Fils’ three) with its lute stop. Older Forqueray intégrales are out of print (Christophe Rousset, Yannick Le Gaillard, et al.). A smattering of suites currently available (Mitzi Meyerson’s muffled Third and Fifth on Virgin 724356187221 and arrow-straight Luc Beauséjour on Naxos 8.553717) suggest that Rannou warrants investigation. While we’re here, the hands-down Forqueray intégrale for viol is Paolo Pandolfo’s on Glossa GCD 920401 (O/P). Idiosyncrasies impart zesty flavors, and the fluctuating basso continuo (Guido Balestracci, viol, Guido Morini, harpsichord, Rolf Lislevand and Eduardo Egüez on theorbos or Baroque guitars) provides a vibrant backdrop for Pandolfo’s melancholy tones. Relatedly, an interesting viol-centered program on Zig-Zag offers Forqueray among homages interspersed with contemplative tombeaux. Colorful interpretive liberties including a guitar prelude before a sprightly La Leclair are alone worth the price of admission. The two bits from Rameau’s Pièces de Clavecin en concerts sound modern and in a league above the rest. Curiously absent is François Couperin’s La Forqueray which would have fit even in its pure keyboard form, given that Forqueray’s La Rameau appears on solo clavecin. The contrast between homages and tombeaux is striking. Naïve Astrée E 8592 interleaves tombeaux among Lalande’s Leçons de Ténèbres for fine effect, including Louis Couperin’s stately Tombeau pour M. de Blancrocher and Marais’ Tombeau pour M. de Lully and Tombeau de Sainte-Colombe. French Baroque recitals routinely intermingle homages: Couperin’s La Forqueray, Forqueray’s La Leclair and Duphly’s La Forqueray are interspersed between four Leclair sonatas with Simon Standage, violin, and hushed harpsichordist Nicholas Parle on Chandos 0726. Johann Sebastian BACH: The Art of Fugue (ca. 1740-50), BWV 1080. Pierre-Laurent Aimard (pno). DG B0010765-02 (http://www.deutschegrammophon.com/). Johann Sebastian BACH: Six Concertos for the Margrave of Brandenburg (ca. 1721), BWV 1046-1051. 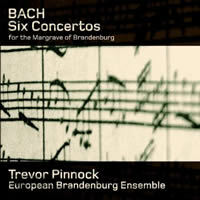 European Brandenburg Ensemble, Trevor Pinnock (hpsi, cond.). Avie AV 2119 (http://www.avierecords.com/). Distributed in the US by Forte Distribution (http://www.fortedistribution.com/). 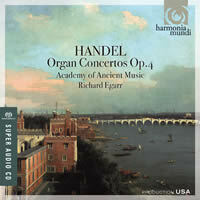 George Frideric HANDEL: Organ Concertos, Op. 4 (1738). Academy of Ancient Music, Richard Egarr (org, cond.). Harmonia Mundi HMU 807446, SACD (http://www.harmoniamundi.com/). To identify the various canons and fugues which comprise Bach’s summa as pièces does the master a disservice; however, if I don’t mention Aimard’s 78:36 of the D minor here, I never shall. His casual approach to tempo may startle, and he admits imagining a scoring for other than the piano: The organ might be more appropriate for Contrapuncti I, III, V and X, whereas IV suggests chamber music, and XII, a cappella choir. 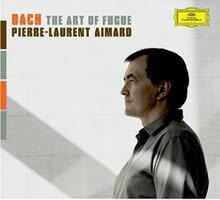 The results so captivate and at a point along the way I no longer hear a piano but rather Bach’s pure lines. The incomplete fugue stops abruptly, without pathos. Similarly, the Brandenburgs are decidedly remote from pièces. In this recording there are really only two explicit solos, a florid cadenza bridging the Third’s two extant movements and the Fifth’s extended harpsichord solo. This set offers excellent playing, such as the Second’s trumpet and the viola, viola da gamba, violoncello and violone blend in the Sixth, but the knockout performance has to be Pinnock’s solo in the Fifth. I’m used to performances that treat the keyboard cadenza as an inconvenience to be endured before the final tutti. As a pure delight, Pinnock’s virtuosity and drama is not to be missed. I lack the gene that ensures unequivocal appreciation for Handel. However, Egarr’s modest “noodling” atop a four-stop chamber organ (a 2005 Robin Jennings) alongside the Academy of Ancient Music invites the listener’s appreciation of what begins to resemble a series (Op. 3 appears on HMU 907415). No. 5’s familiar Presto and No. 6’s Andante profit from Egarr’s fresh approach enhanced by a continuo alternating between archlute and guitar. Continuing his exploration of period tunings, Egarr’s mean-tone portative heightens remote modulations.